Pierre Botnem, CESAM Marine Surveyor, interviewed by Patrick Lemarié. 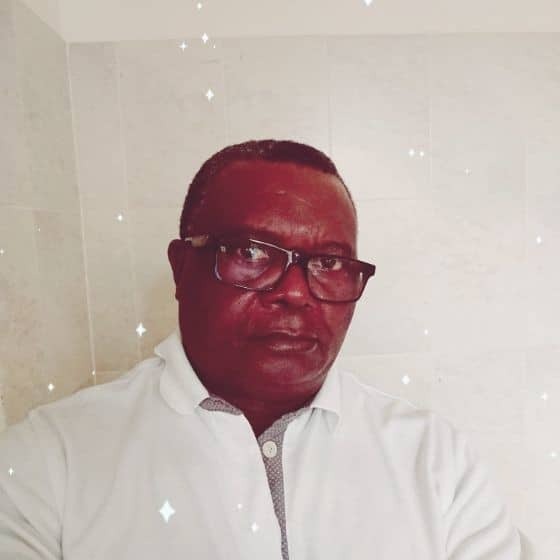 Hello Pierre so that your future customers can get to know you better, I will ask you today a few questions about your professional background and what led you to become a Marine Surveyor. 1. How long have you been a marine surveyor and what led you to this profession? I have been a Marine Surveyor for 12 years, including one year of apprenticeship. 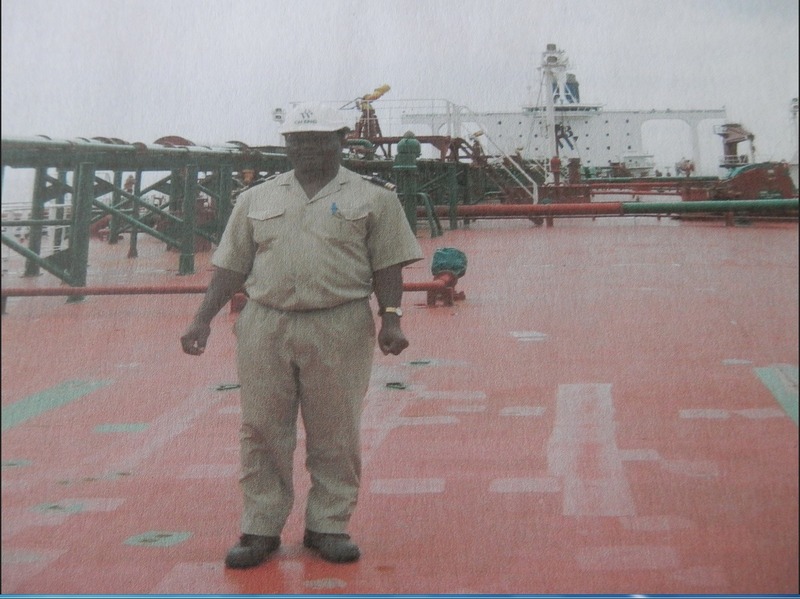 Indeed I have been a Marine Surveyor and Damage Commissioner of CESAM in Gabon at Port-Gentil for 6 years. 2. What is your initial training and to what extent has it helped you to become a maritime surveyor today? I am a Chief Engineer Officer (Energy and Propulsion) trained at the Groups of the Schools of Energy and Propulsion of Toulon Navale in the French Navy. As a mechanic by training, I had a good profile for the expertise of cargo, hull and machinery. It was to satisfy the need for an Expert in this region that I was recruited by CESAM through the company « Les Commissaires aux Avaries Réunis » one of their subsidiary in Cameroon. Then I was sent to Port-Gentil. Port-Gentil is an oil city that required the presence of a surveyor specialised in the surveying of cargoes, hull and machinery to monitor damage and deterioration on Tankers, sea-supply vessels and barges. They also needed an expert to monitor and cover certain maritime operations to certify the condition of the ships or their ability to perform certain manoeuvres in order to enable insurers to provide the coverage. 3. What do you think are the qualities required to carry out your missions? To be able to respect the ethics of an expert. 4. What are the typical survey missions that you carry out most often and for which type of client? – The survey of the cargo, including the transported goods. – Example: Marine warranty Surveyor for off shore & on shore.Installation activities. I work for Insurers, Underwriters, Shipowners and Companies. 5. What are your strengths and assets in the context of an expertise? It would be very difficult for me to bring out my particular strength. 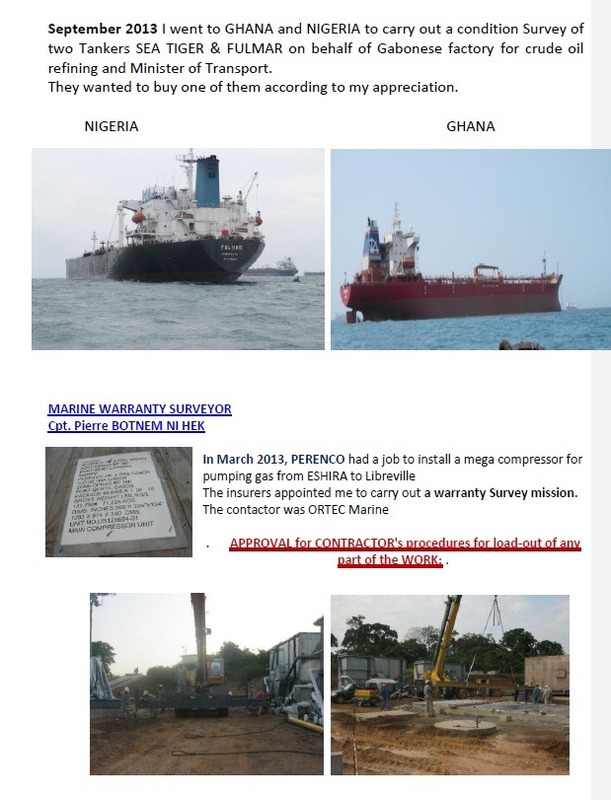 I am good in the fields of expertise concerning my specialty and marine cargo. 6. Do you also provide marine surveys in English? I can also provide expert reports in English, as I work in partnership with a translator who has an extensive experience in the maritime world. 7. Do you also work outside Gabon? Indeed, as a member of UPEM, I can intervene wherever I am called. Closer to me in CAMEROON, CONGO, NIGERIA, and GHANA. 8. Do you have an anecdote related to your profession to tell us? – In 2008 « BV STADT » a 35,000 HP tanker, owned by « the GREEN TANKERS » company was mooring off Port-Gentil and had a Damage on cylinder N°5: the liner was faulty. This jacket was the third in the same engine to suffer such damage. The Insurers were wondering where this recurring damage came from and yet there was a maintenance company on board. This is how the ALLIANZ GLOBAL CORPORATE & SPECIALITY Insurers of Marseille, a Member of CESAM asked me to appraise the said Tanker. I went on board. I questioned the Captain, I investigated with the chief engineer and asked many questions. I took the necessary documentation and went back to the office to write the report. the added value of the mission. I carried out this survey mission of the vessel equipment with an unprecedented competence. Apart from the professional experience, I practically offered a lecture to the readers of the report… From the occurrence of the damage to the causes and the responsibilities of all the people involved, everything was clear and persuasive. The insurers remained perplexed and admiring of my expert report. After this survey, the CESAM Insurers sought to know who I was, who the expert who carried out this excellent Expertise was, and they inquired in Toulon at the « Groupes des Ecoles Energie et Propulsion »; then they contacted the Ministry of Armed Forces of Cameroon to know who I was. They got the complete information they wanted. The skills of the Maritime Expert across borders. Finally, they concluded by saying: « We couldn’t think that an engineer from the South could be capable of such a deep technical knowledge. This story was told to us by Mr Thizon, Director of the Commissioners of Damage, at our end-of-year meeting in Douala. It was from there that my reputation and competence grew in CESAM. Thank you Pierre for answering my questions which will help your future clients to know you better. It is rather me who thank you for giving me this opportunity. To consult Captain Pierre Botnem’s other missions, just click this link. Interview of Pierre Botnem, CESAM Marine Surveyor by Patrick Lemarié, translator specialised in maritime matters.